With Renamer 5, you’ll wonder how you ever renamed several files before. Let’s try out some simple renaming actions you can try with Renamer. Renamerlets: This is where you can group singular renaming chains. 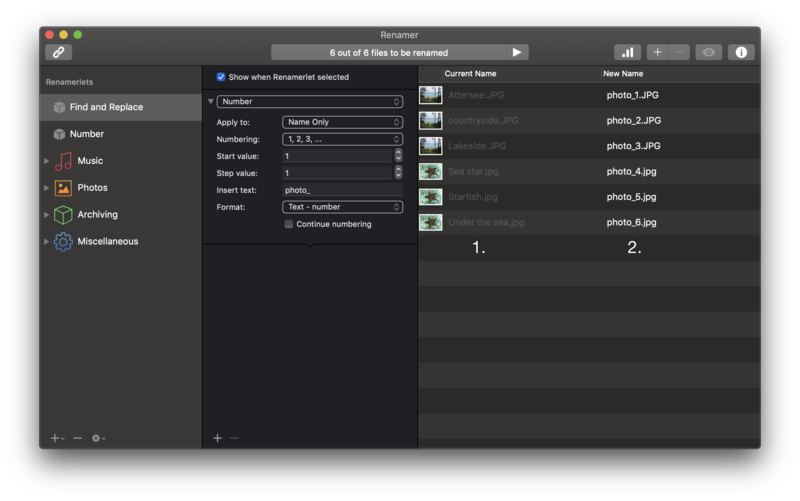 In Renamer 4, these were presets, now in the front row and center for you to organize. Chain: Here you’ll find the Renamerlet actions for the currently-selected Renamerlet. When you perform a rename, each action will be applied at a time, from top to bottom. 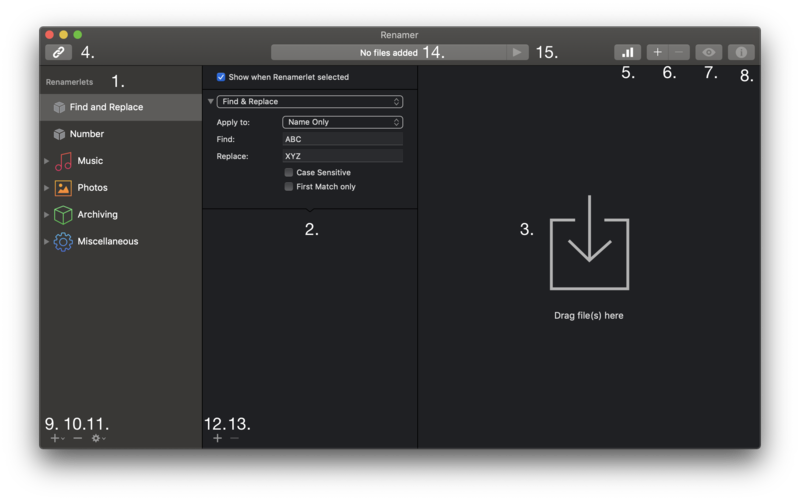 File drop area: Drag files here to start with Renamer. Add or remove files to Renamer. Show info on selected file. Quite a mess, right? We’re gonna fix these up with Renamer. By dragging them onto the drop area on the right side of the window. The current names of the files you’ve added to Renamer. What the names of the files will change to once you’ve clicked on Apply. You might be wondering why the right-side column is all “Filename will remain unchanged”. This is Renamer’s way of telling you that the actions are in the chain at the moment won’t have any effect on the files. The current action in the chain is a “Find and replace” action that replaces ABC with XYZ. None of the files currently have the string ABC. At the top of the chain, you’ll find a dropdown with the current Renamerlet action name on it. You can use this to select an action to be applied. Let’s tweak these to make our filenames consistent. 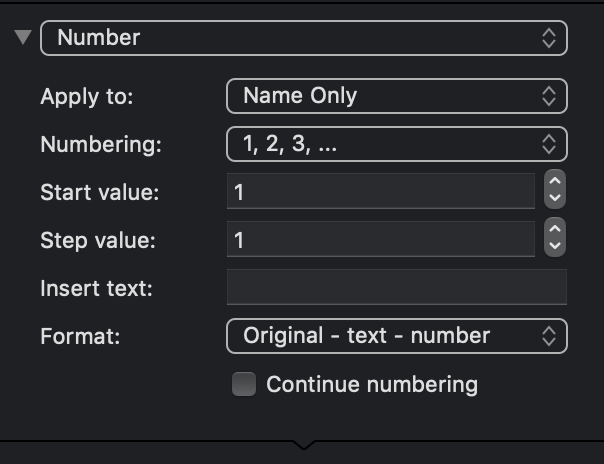 Set the Format: field to Text - number, and the Insert text: field to photo_. You’ll notice that the values in the column “New Name” change live as you enter values. Please note: This does not mean the files are being renamed live. You need to click on Apply in order to rename them. Click on Apply. 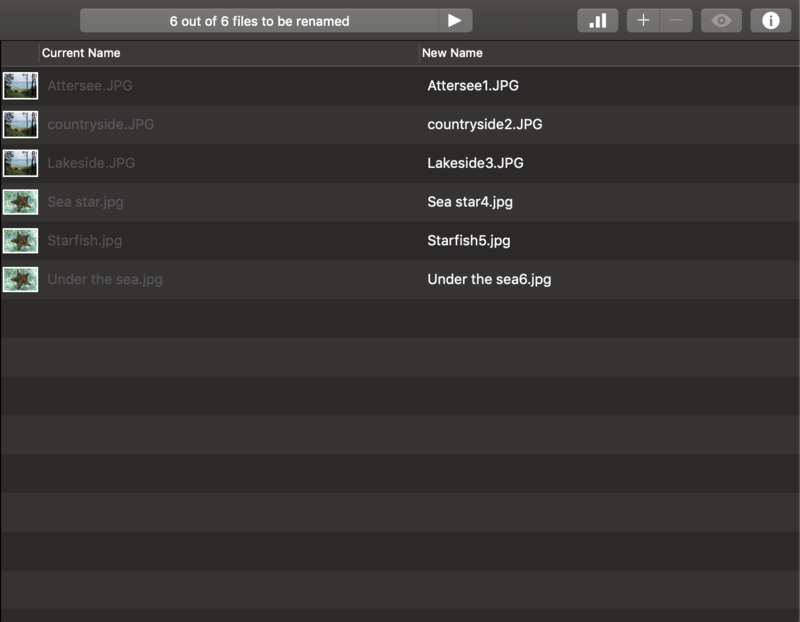 The files will be renamed (you can check in Finder to verify!) and you should see the “Current Name” values updated. You might be wondering why the “New Name” column values are set to “Filenames will remain unchanged” again. 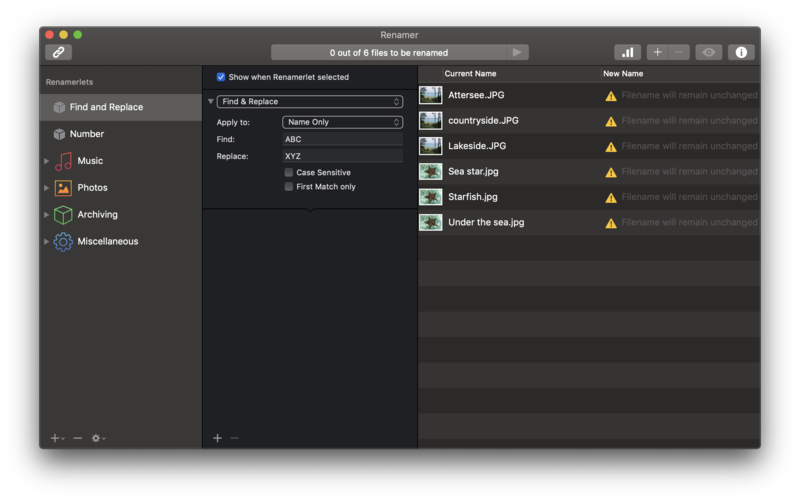 This is because we’d be renaming each file to the exact same value as before.